Peel and chop the mango and jicama in small, even pieces; sprinkle with a teaspoon of lime juice and reserve. Halve the avocados and remove the pits; scoop the flesh into a medium bowl. Mash coarsely with a fork, then add the remaining tablespoon of lime juice, salt and garlic and mix. Stir in the scallions. Spread the guacamole in a small serving bowl. 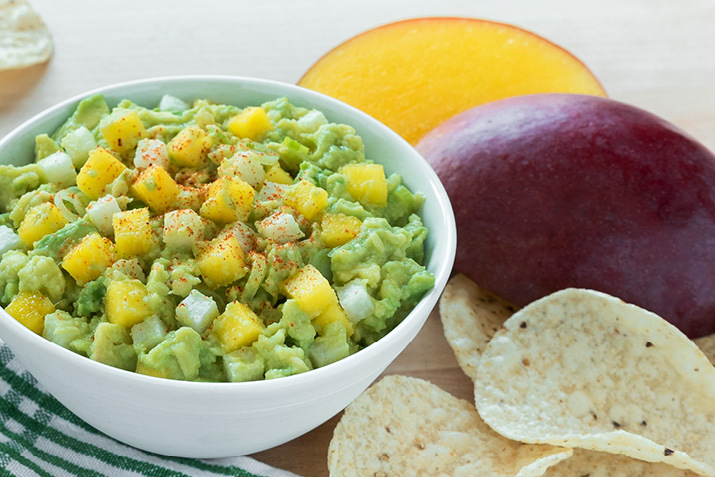 Sprinkle mango and jicama on top of the guacamole, then dust with chili powder. Serve immediately with chips or quesadillas. This is a fantastic dish to serve at a party; just double (or triple) the recipe and use a wider bowl or small casserole dish. The crunchy jicama, sweet mango and creamy avocado are a delicious topping for tostadas and quesadillas, too.